Fuchs My Lubricants Company Shelf Strips - 24 Strips of 600mm x 25mm - Covers 12 metres. 1200 x 600 for indoor or outdoor use. 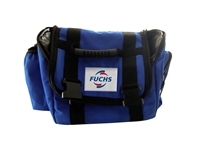 Fuchs Cooler Bag - Holds 8 cans internally. 10 Metres per length - Double sided in Fuchs corporate branding Pack of 200 Bags. PLEASE NOTE - During Fuchs corporate re-branding, some bag orders may include a mix of old and new style bags depending on old stock status. Corporate Pull Up banner - Includes carry bag. Corporate Pull Up banner - Includes carry bag. Corporate Pull Up banner - Includes carry bag. Corporate Pull Up banner - Includes carry bag. 3 Shelf Renolit Grease Stand. For display of 20kg, 2.5kg, 500g and 450g Renolit products. Fuchs In-Store Metal Merchandise Shelf. 100cm wide x 180cm tall x 53cm deep. Available early May 2018. 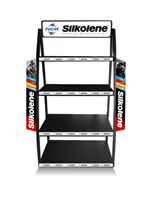 Fuchs Silkolene In-Store Metal Merchandise Shelf. 100cm wide x 180cm tall x 53cm deep. Fuchs Workshop Display, ideal for 5L, 4L, 1L, 500ml and Cartridge Products.